Antec, founded in 1986, is a name that will ring in familiar with long time PC enthusiasts as a manufacturer of cases and power supplies. One of the first cases I ever owned was an Antec SX1040, a very popular case which was actually a re-branded Chieftech Dragon. 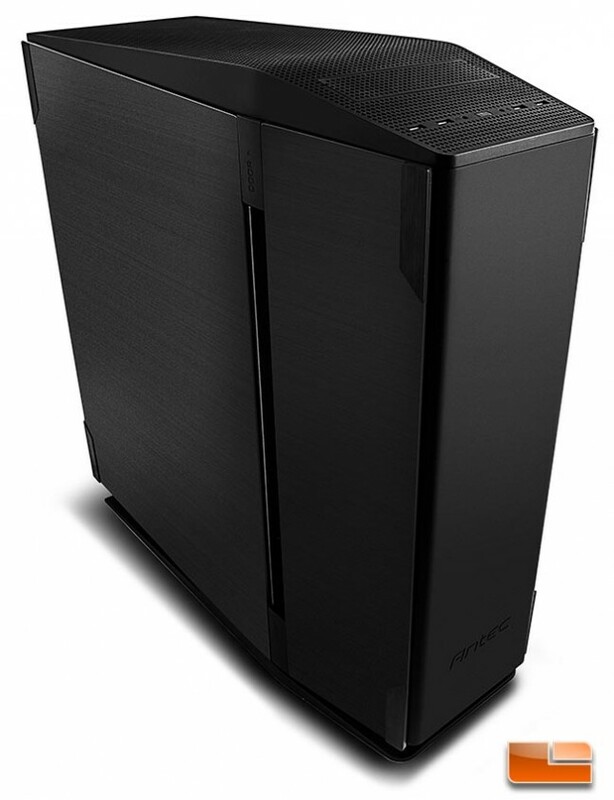 Antec would improve from the SX1040 and later release highly awarded and praised cases such as the Sonata and their first chambered case, the P180, which were designed in-house rather than being re-branded products. These were Antec’s glory days and its safe to say that they would like to return to them, because for those of us who weren’t building our own systems a decade ago, Antec probably won’t come to mind as a premier case manufacturer among the likes of Corsair, NZXT and Phanteks. It has been several years since Antec produced a case that really turned heads and got enthusiasts excited. In fact, Antec had alienated enthusiasts with releases such as the Nineteen Hundred, which was met with reviewer dislike for being overpriced and not meeting enthusiast needs. Antec had rested on its laurels and was comfortable to ride on their past success, but consumers took note and soon turned to different brands who were paying attention and catering to the needs of PC enthusiasts. Antec has noted consumer feedback and with their latest release, The Signature Series S10, they hope to get enthusiasts excited and talking about the Antec brand in a positive light once again. Antec went with an outside design firm, Astro Studios, to assist them with the overall design of the Signature Series S10. Astro Studios has worked with several Fortune 500 companies and was the studio behind the design of the Nike Fuel Band. Hiring outside design studios is an interesting concept, but it does cost money and will definitely add to the production cost of any product, which is reflected in the price of the Signature Series S10, which rings in at $319.00 shipped after rebate (MSRP is $499). The standard version of the Signature Series S10, which we are reviewing today, has well-constructed aluminum side panels that collect fingerprints really easily. A version with nicely toned, well-built tempered glass side panels, the SG10, is supposedly coming soon, but we can’t seem to find it for sale anywhere as of this review being written. Beyond producing a subjectively good looking case, Antec has high hopes that the Signature Series S10 hits all of the marks necessary for an enthusiast chassis, because it’s current asking price puts it in a very exclusive category with other high end cases designed to house huge, watercooled systems with extensive component setups, such as the Corsair 900D and even custom units from CaseLabs. 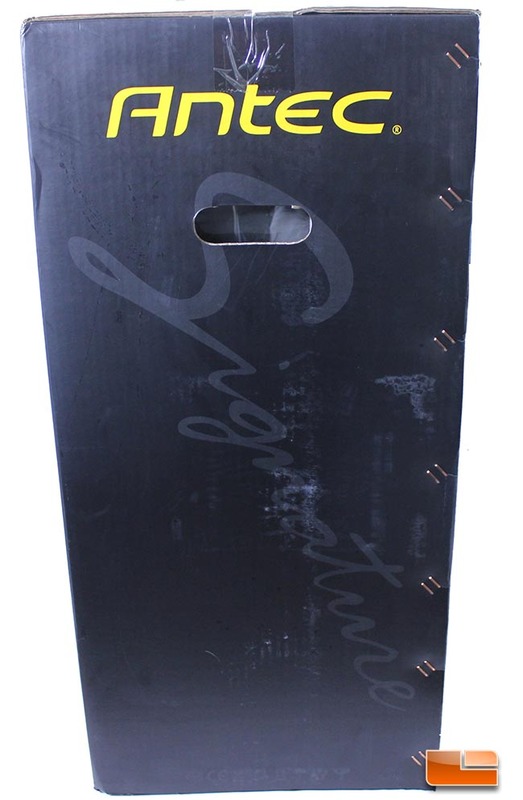 The Signature Series S10 is packaged in a large cardboard box with a graphic of the side profile of the S10 printed on it, which is otherwise devoid of any information. The packaging is very understated and plain. Antec has also printed ‘Signature’ in a lightened cursive text on the side of the box. 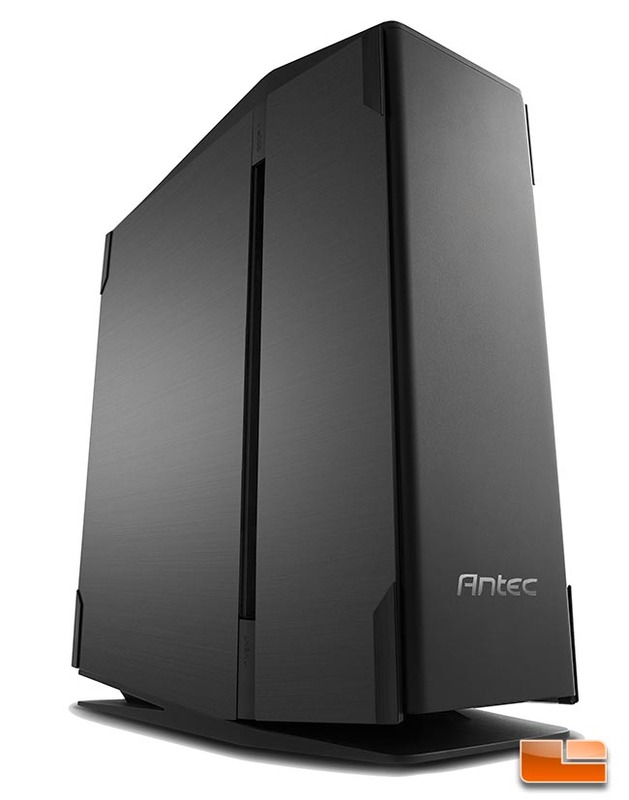 Compared to other boxes from Antec, such as the one the P380 ships in, you get a sense that Antec purposely wanted the box to almost evoke mystery and elegance. Antec has packaged the S10 in between very thick Styrofoam inserts that are held together with a large amount of tape, which of course made the Styrofoam fall apart when we peeled it apart. Within the Styrofoam, the case is protected by a plastic bag and there is an Antec-branded plastic tray being used to hold the case doors shut during shipping. 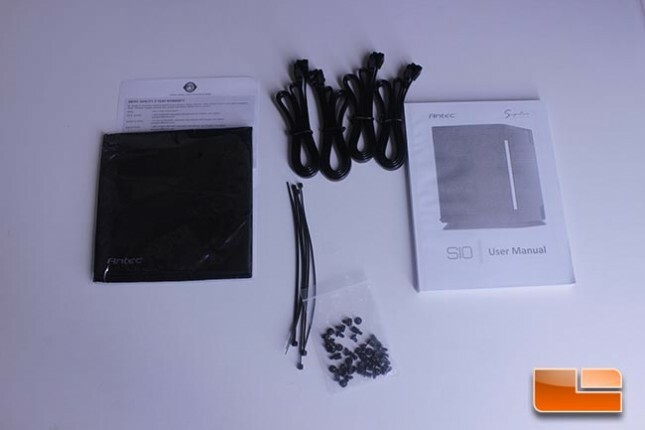 Antec has thought out the packaging of the Signature Series S10 very well and the case arrived well-protected and without any apparent damage, though unpacking it was a bit of a task. 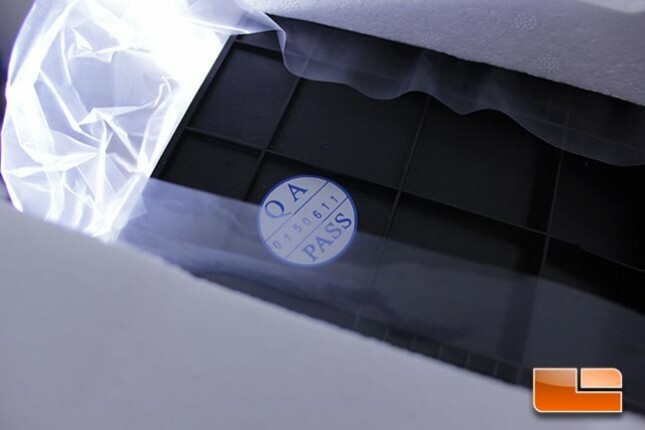 There is a large QC sticker on the bottom of the case base, as well. The Signature Series S10 ships with a very basic, almost bare-bones accessory kit containing screws and five zip ties, though the Antec-branded microfiber cloth they’ve included is a very nice touch since the aluminum panels are going to pick up fingerprints. This is the complete accessory pack. Antec does include warranty literature with the case and the manual for the Signature Series S10 is huge, with information on how to build into the case. With this case carrying such an elite price tag, I would have expected to see more zip ties, Velcro wraps and other accessories to assist the end user in cleaning up the wiring on their builds. Antec has included all of the screws in one bag, which isn’t labeled. 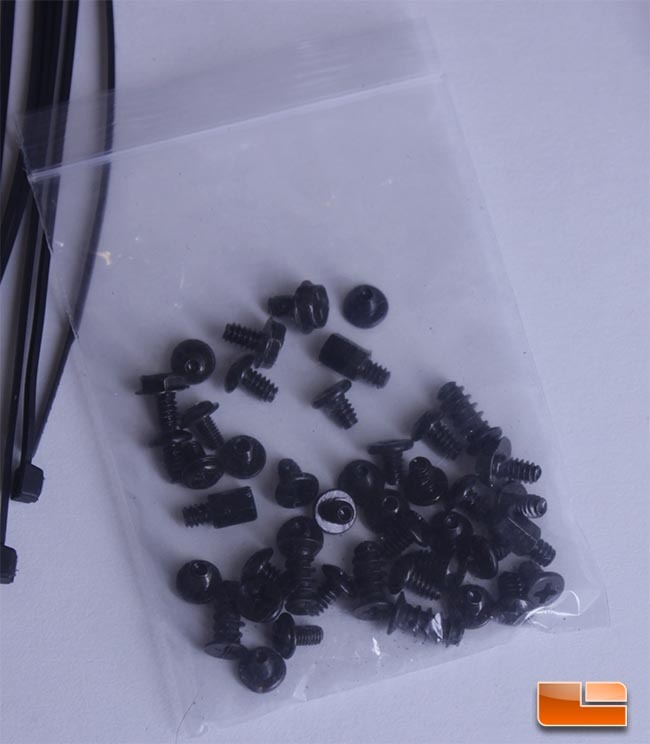 Most manufacturers, even with cheaper cases, put screws in individual bags that are labeled. This is inconvenient, as getting to the screws you need will mean fishing through a bunch of others you may not even end up using. This can also cause confused users to accidentally use motherboard mounting screws for drives, or vice versa. Given the height and chambered design of the Signature Series S10, standard SATA cables may prove too short to reach from your drives to your motherboard, especially when using upper drive bays. 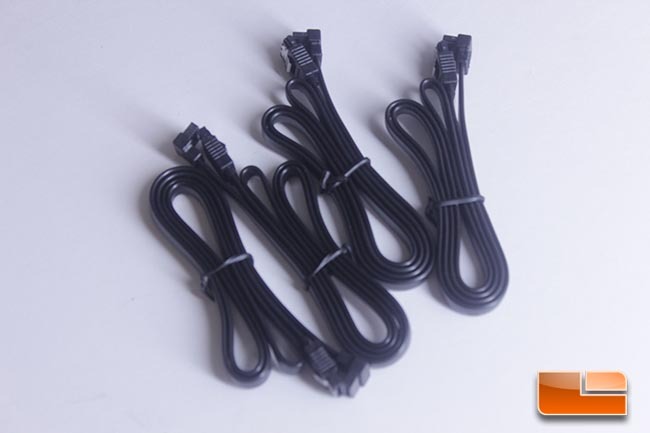 Antec has addressed this by including four extended SATA cables. Given the price, I feel that Antec should have included more of these cables in the accessory pack. 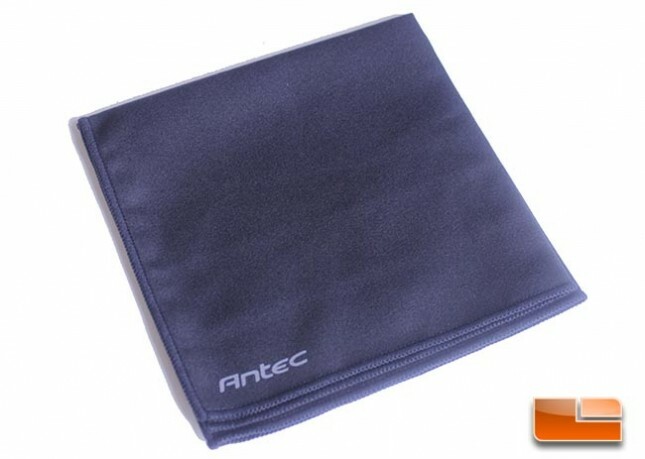 This microfiber cloth came in handy when working with the case, as the side panels loved to pick up fingerprints, dust or anything else that they could possibly attract. There isn’t an 8-pin CPU power connector extension included in the accessory bundle, either. An 8-Pin extension cable was included with the last two cases I’ve reviewed, both of which were a fraction of the price of the Signature Series S10 and neither of which actually ended up requiring me to use the connector. The Signature Series S10 is a tall case and most users will likely require this cable extension, but Antec has omitted it. With the price premium carried by the Signature Series S10, the accessory bundle is lacking, to say the least. Let’s take a look a closer look at the external features of the Antec Signature Series S10, now.